Any time I am asked, “What coral should I get first?” my immediate answer is Mushroom Coral. More specifically the Discosoma Mushroom. They are in my opinion the easiest coral to keep. They come in a huge variety of colors. They will grow and spread at a faster pace than most other coral. Best of all they are one of the most tolerant out of all corals to dirty water. What type of coral are they? Natural Habitat Coral Reefs of Fiji, Indonesia, Tonga, etc. 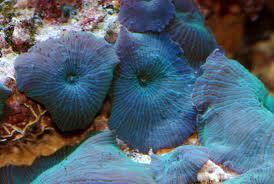 Mushroom coral are classified as a soft-coral because they do not have a hard stony skeletal system made of calcium. They are actually part of the order called Corallimorpharia which other than the stony tidbits are closely related to Scleractinia, or hard stony coral as I like to call them. Mushrooms are photosynthetic and will draw energy from light. Well, not really, but kind of. They actually have a symbiotic relationship with a single-celled microorganism called Zooxanthellae (zo·o·xan·thel·la). Yea say that 5 times fast! Zooxanthellae are actually the ones that are photosynthetic. The mushrooms have a colony of these guys inside their body and they then feed on them. It would be like having a colony of Big Macs in your belly that you could just digest as needed. These Z Macs don’t even need that much light to grow and feed the mushrooms, at least not as much as some light intense hard stony corals. Mushrooms will also feed on things that land on their disc as well. They have a mouth at the center of disc. If food lands on the mushroom, it can close up to shovel the food into its mouth. Most mushrooms that are readily available in the aquarium trade will have a disc about 2” – 7” a round when fully stretched out. Their stalk will be between 1” and 3”. In the wild though, there are some mushrooms like the elephant ear that can be 18” or more. These are typically not sold at your local fish store though. Discosoma Mushrooms reproduce via pedal laceration. Here is how that works. Mushrooms will actually move constantly around your tank. Don’t worry, they move even slower than a sloth and could take years to go from one side of a rock to another. While they move though, they will at times have a small portion of themselves to break apart and stay behind. This small part that is left behind will grow into a new mushroom. Another reason I love mushroom coral is because they are easy to propagate. Propagation is the process of taking a cutting or clipping from the mushroom so another mushroom will grow. To successfully propagate them you should always cut through the mouth. If you are able to you can cut straight through the mouth separating the stalk down to the rock. You can then chisel the rock in half or use a bone cutter to break the rock so both halves remain attached to the rock. If you can’t or don’t want to break the rock, don’t worry. They will attach themselves to another rock very easily, you just need to give them the chance to do so. Don’t make the mistake I did the first time I tried to attach one. You can’t glue them to a rock or frag plug like other corals. The fact that they cover themselves in slime and shrink up overnight makes gluing small clippings a no go. I had one small frag annoy the mess out of me because it kept coming out of the glue overnight before I learned this next trick. All you need to do is put them somewhere with several pieces of rock rubble or frag plugs that they can attach themselves to at their own pace. It can take up to two weeks for these guys to do this however. The catch is getting them in a place with low enough flow to let this happen. The best option is to have a very, very low flow frag tank with lots of rock rubble across the bottom. Drop them in and wait. If that is not an option, and for most people it is not. Take a nice sized Tupperware container, fill the bottom with rock rubble or plugs, and place it somewhere in your tank that gets less flow. The idea is the container walls will help reduce the flow from hitting it so it can stay on top of the rubble and attach. You can also cover the top with a mesh netting to allow water in and out but not mushroom clippings. Be careful though, the netting is a great place for algae to grow so keep it clean or it will choke out the mushrooms you are trying to grow. Every high has a low, and mushrooms are no different. The fact that they are so hardy and relatively easy to keep is actually what some reefers would call their downfall. 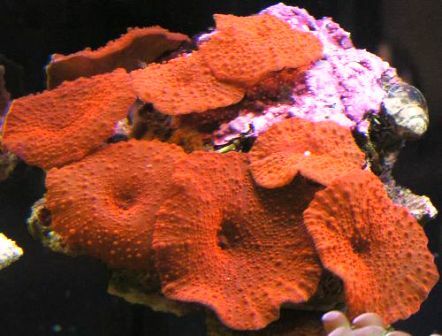 In a healthy well established tank mushrooms can grow and reproduce much faster than other corals you may be trying to grow. This means if left un-checked they can encroach on and even choke out other coral for their territory. Having a $10 mushroom overrun a $100 super fancy chalice is not going to be the happiest of moments. The truth is though this just means you have to do some pruning. Once you have reached the point this is an issue, you will be an ace reefer. You can pluck extra mushrooms out of your tank and give them to your friends as they join the hobby or maybe sale some to your local fish store, even if it is just for store credit. Discount on that new super fancy chalice, chaching! When you start to shop, be it in your awesome local fish store or online retailer, you will no doubt see many types of mushrooms. You need to know not all mushrooms are good beginner coral like the Discosoma Mushroom we have been discussing up to this point. 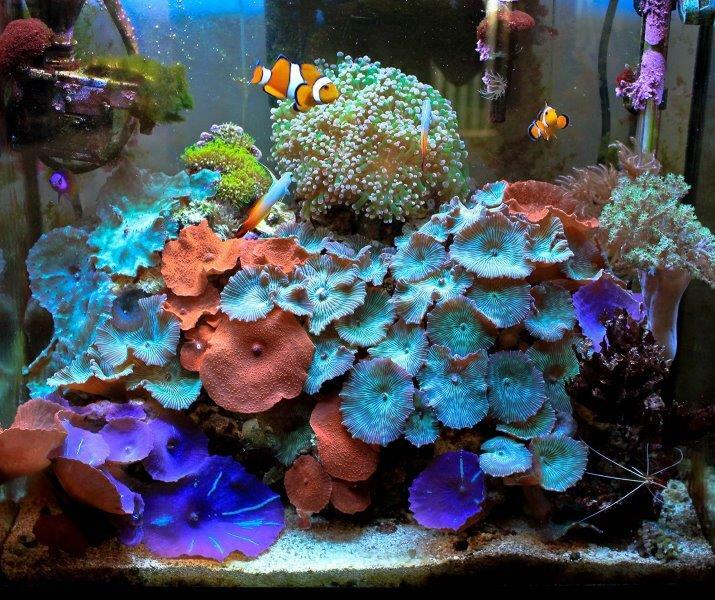 It is a good idea to familiarize yourself with them enough to point them out of the tank and if this is your first coral purchase and first coral tank, avoid them. Save these for several months down the road and then pick up these beautiful creatures. Ricordea come in two varieties the Ricordea Florida which hails from the Caribbean and the Ricordea Yuma which is found in the Pacific Ocean. Both come in very bright colors and offers some even more brilliant colors than Discosoma. These mushrooms are covered in bubble like tentacles. Some Discosoma have bumps on them but not to the same extent as Ricordea. The tentacle placement on the Ricordea are different between the Florida and Yuma variants and is one of the primary ways to distinguish between the two. Yuma will have tentacles around the mouth in the center and they will also be uniform in varying rows of large and small tentacles extending from the center. Florida Ricordea will be more uniform in size of tentacle across the whole disc of the mushroom. These mushrooms will be harder to keep, can require special feeding and due to their coloring are often some of the more pricy mushrooms. Ricordea are not on my beginner coral list. Rhodactis range in sizes from 1” to the giant 18” Elephant Ear mushroom I mentioned earlier. They are also one of the most expensive mushrooms you can find. Rhodactis will reproduce in the same way that Ricordea do, which is longitudinal fission. Where Discosoma which are in perpetual slow motion leave behind a toe here and there which will grow into a full mushroom; Rhodactis and Ricordea will begin to split in half separating right down the middle through their mouth. Each half is now its own mushroom and will grow back its missing half and split again. To wrap things up, mushroom coral, more specifically the Discosoma mushroom are my number one recommendation as your fist coral purchase. 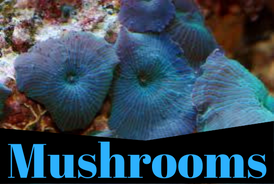 As of this writing they typically can go for $10-$30 dollars per mushroom depending on their color rarity making them one of the more cost conscious corals you can pick from. The only big downside is that some experienced refers will complain about how they can grow fast and take over portions of a tank. Riddle me this Batman, as a beginner, isn’t that exactly what we really want to see our coral doing? What is your experience with this coral? Let me know in the comments below.